Someone once said there are no new ideas, just reinterpretations of the old ones. With an upscale twist and a tweak, sales of the yard, garage, tag, and rummage variety now have a new cachet. Nearly everyone has bought a nifty little pre-owned item and been thrilled with the innovative choices on offer. In today’s economy, selling secondhand jewellery is the new normal. Whether you label it estate or vintage, choosing a term that fits your current clientele and hoped-for newbies gives you an advantageous head start. Word choice aside, the layman’s connotation of estate is usually a pretty positive one, and the old stigma attached to ‘used’ goods is no longer a barrier to sales. The car industry prefers euphemisms like ‘executive-driven’ and ‘pre-owned,’ while television programmers entice viewers with ‘encore performance’ instead of re-run. In North America alone, there’s a multi-billion dollar industry for second-hand jewellery and not just via the traditional methods of buying at auction or thru online operations like eBay, kijjiji, and Craigslist. With the price of gold up 400 per cent in the last 10 years and record highs in 2011 of more than $1900 US per ounce, it’s time to get with the program and give the resale idea some thought, time, and money. Tag team your effort to whatever’s happening in TV, movies, glamour and fashion magazines, etc., to take advantage of any free publicity on the subject. There’s a popular theory it takes 10,000 hours of practice or the equivalent of 10 years’ experience to become an expert in any specialty. Realistically, you’re probably not going to have that sort of time or energy. Yet, it’s still possible to do a reasonably good job getting information across to your clients (and educating yourself, too) by relying on establishing trustworthy relationships with various antique jewellery dealers. Beware, though‚Äî pricing can be daunting, especially for an item that might be a one-of-a-kind piece. Markups will be whatever your market bears. Auction house websites are a good resource for values, as they usually maintain archives of recent sale results. Take advantage of this wealth of research material available online, while offline, there are pretty pictures in lushly illustrated full-colour books covering the history of jewellery periods. Bookmark a few reputable compatible sites on your iPad. Don’t forget to put trade magazines and periodicals at the top of that list. A chaotic hodge-podge of various periods could be less effective than having no estate items at all, so maybe concentrate on one era at a time. Base the collection on your particular demographic, location, and market. Pick your top few choices and concentrate your efforts, time, and money. Rather than a larger all-encompassing history through the periods of jewellery, starting with a small, select grouping might be better perceived and received by customers, and there’s always room for expansion. Art nouveau enamel, diamond, and 18-karat gold pendant, circa 1905, by Vever. Retro citrine and diamond brooch in 14-karat gold, circa 1950. 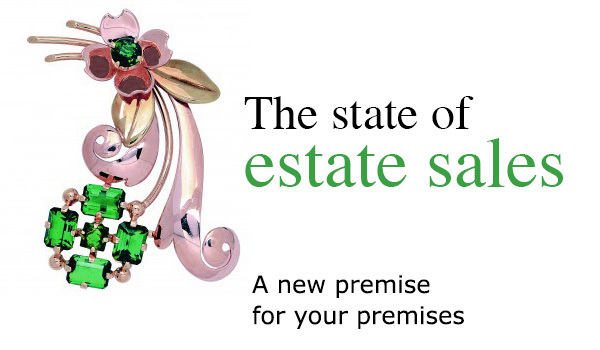 Dedicate a particular physical area in your store to the estate side of your business. Customers will appreciate the feeling that comes with a touch of exclusivity. A series of architectural drawings or pictures of celebrities convey the associated periods and wouldn’t incur a great cost. Dramatic black and white imagery can be equally as effective. Inexpensive postcards or downloaded copyright-free images representing the different eras also evoke a sense of history. There are four popular periods among estate jewellery connoisseurs. 1) Art deco is associated with film noir onscreen glamour, all juxtaposed angles and repetitive linear geometry, with either monochromatic colourless diamonds or the other extreme of tutti-frutti colours and the sharp contrasts of black onyx, pink coral, green jadeite; New York’s Chrysler building or an edgy painting by artist Tamara de Lempicka or Ert√© evoke geometric streamline moderne. Rings and bracelets will be an easier sell than brooch clips; all will have the cool, clean linearity of typical art deco designs. Platinum and diamonds and icy rock crystal jewels accented with baguette-cut stones transcend the fickleness of trends that come and go and comfortably straddle an old idea with a beguiling relevance for today’s fashion-conscious consumer. Natural or synthetic ruby and sapphire accents are true to the 1920s, as are individual pieces comprising multiple cuts of diamonds. Bestsellers, or look-a-likes, are from Cartier, Tiffany & Co., Van Cleef & Arpels, Asprey, and Mappin & Webb. 2) Retro pieces from the mid-30s to early 50s often have architectural, odeonesque curves and arcs side by side, with a square or rectangle shape set with different gemstones; broad bands on the finger or wrist are decorated with bold motifs; round beside square has a modish and modern look, and when accented by attractive asymmetrical details, pieces have a distinctly contemporary feel suitable for today’s fashion-forward client. Extravagantly sized 20-, 30- and even 100-carat stones dominate rings set with elongated emerald-cut aquamarines, citrines, smoky topaz‚Äîthe bigger, the bolder, the better. Pink, yellow, and green gold were typical metals in use. Names to watch for are Cartier, Tiffany & Co., Mauboussin, Verdura, and Flato. 3) Victorian styles comprise a vast choice spanning 63 years. The mourning series with jet bead necklaces, drop pendant earrings, and rings that could have been made yesterday, have a contemporary flair and look great with current fashions. 4) Art nouveau‚Äîwhich spans the 1890s to 1910‚Äîhas a fluid romantic look leaning toward a traditional feminine stereotype, which depending on your market, may be a tougher sell. Brooches and pendants are all romantic flowers and vines, dragonflies, sensuous curves, and whiplash tendrils similar to the original decorative cast iron subway entrances of the Paris Metro stations or dreamy pale advertising posters from Toulouse-Lautrec and Mucha. Famous examples come from Tiffany & Co., Lalique, and Vever. It’ll take a bit of time, commitment, and cash outlay to challenge yourself and your customers, but the potential gains are unlimited and worth the risk when you take advantage of the healthy attitude for resale in the estate market. Adventurous, downright avant-garde flamboyant, or classic conservative, every era suits every esthetic. Helping clients indulge in a little fantasy of time travel may bode well for your future.